The Prints of Roy Lichtenstein, National Gallery of Art, Washington; Los Angeles County Museum of Art; Dallas Museum of Art; Parrish Art Museum, Southhampton, NY, 1994-1995, 125, no. 112. 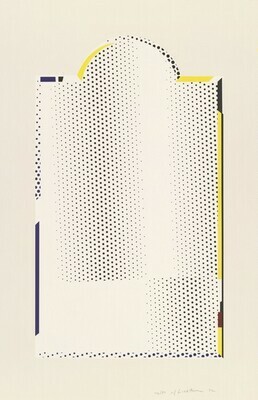 The Prints of Roy Lichtenstein, National Gallery of Art, Washington; Los Angeles County Museum of Art; Dallas Museum of Art; The Parrish Art Museum, Southampton, 1994-1995, no. 47. Gemini G.E.L. Sequence List. Los Angeles, California: Gemini G.E.L., unpublished, no. 388.